After doing a some calculations today I realized I need to kick up my Jeep bumper research a notch. Since I started working out and running some of my clothes are too big for me. So instead of wasting space in my closet I decided to sell them on eBay to earn money for Jeep Parts Fund. While I was at it I convinced my kids to sell some of their Legos. Well... after my kids cut and the selling fees I have earned..... drum roll.... $500. I'm so pumped! And I still have a lot of Legos left to sell. Now the shopping begins. But it's so overwhelming. Since this is all so new to me I'm looking for your recommendations. 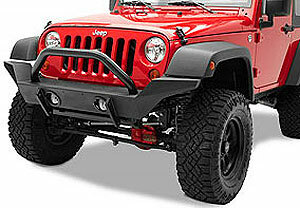 My first purchase will be a front bumper. I would like the option of something that I could add a winch to eventually. At first I wasn't going to do a winch but since we get snow here in Maryland I figure it might come in handy in the winter. Most folks around here aren't very good at driving in the snow. I would like something that will also protect my grille and headlights I don't really like the the look of the tubular bumpers too well. I want something I don't have to drill holes into my Jeep. Plus... It has to look Beast Mode so my teen aged son will ride with me. I like the look of this bumper. Eventually I would like to do something with the fenders and my stock step rail. Those would be the next two items on my list. Also tune in tomorrow when I explain why I was driving a Rubicon this weekend.